CO_DenverAirport_01 from Bill James on Vimeo. 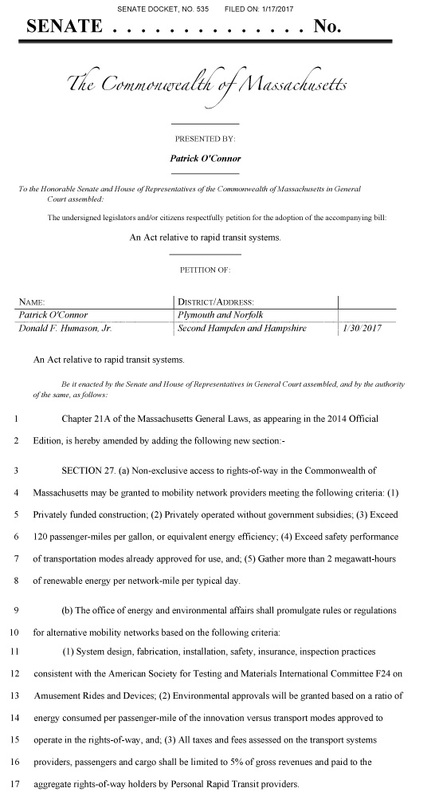 Solar Mobility Act (as adopted in Bengaluru India, passed in Secaucus, NJ, pending in MA legislature). Exceed 5 times the energy efficiency of highways. Exceed the safety of highway. Gather 2 megawatt-hours of energy per mile per typical day. Pay 5% of gross revenues for use of air space over city streets. 4.5 per million injury-rate when regulated by Theme Park Standards. 106 deaths per million regulated by DOT. The legislature passes these laws. As filed in the Massachusetts Legislature, S1970. As soon as a known cost of regulation is defined, capital will invest to convert current traffic costs into value people of Missouri $13.8 billion per year. At least $7 billion per year of these costs can be recovered by combining the efficiency of freight rail with the on-demand service of the Internet. $ 7.3 billion per year for oil. Technically, no law should be required to innovate in America. As explained in five Presidentail veto messages, Federal infrastructure monopolies are unconstitutional. The framers voted 8 states to 3 on Sept 14, 1787 to restrict Federal roads to no more than delivering letters in defense of free speech. They did not want to mix war-making powers with commercial self-interest; the Boston Tea Party had been a lesson in that defect. Until the courts declared the Federal communications monopoly unconstitutional in 1982, communications innovation was stifled in the near century of rotary telephones. Here is a 1968 video of the Mother of All Demos showing nearly every technology in the Internet. America On Line did not begin until 1983. This 1994 video of the Today Show of "What is the Internet"
When the Federal government violates the Constitition it is unsafe for capital to invest. Afer the Constitution was enforced, millions of jobs are created. Liberty is the source of the "general welfare". "What prudent merchant will hazard his fortunes in any new branch of commerce when he knows not but that his plans may be rendered unlawful before they can be executed? What farmer or manufacturer will lay himself out for the encouragement given to any particular cultivation or establishment, when he can have no assurance that his preparatory labors and advances will not render him a victim to an inconstant government? In a word, no great improvement or laudable enterprise can go forward which requires the auspices of a steady system of national policy." The Governor's Executive Order will do for transportation what the courts did for communications in 1982. Restoring liberty to innovate will convert traffic costs into jobs. The problem with pollution and traffic congestion is we are moving two tons to move a person. JPods remove the Parasitic Mass and repetitive applications of power required from Start-Stop traffic. To illustrate how little energy is required, we allowed people to push a JPods mobilie network setup in front of Boston City Hall as part of Boston Green Fest. The small girl is pushing her mother. Judeth (75 years old) pushes a JPods vehicle with 3 people. Remove Parasitic Mass from Bill James on Vimeo. MOA_Radisson_Station from Bill James on Vimeo. The Wright Brothers flew 120 feet and changed the world. Kitty Hawk Networks are commerical grade examples of how traffic congestion, pollution, accidents can be solved. There is a lot of buzz today about self-driving cars. Self-driving cars are important digital devices. JPods digitizes the networks into the Physical Internet®. SMAAASH Kitty Hawk Network 20170426 from Bill James on Vimeo. The Mall may benefit by having SkyRide incorporated into if features. SkyRide has received a second order from Carnival and was recognized as the "Best Cruise Ship Feature of 2016".